Rehabilitation Services is one of DeKalb Health’s busiest departments, seeing a 40 percent growth in visits between 2009 and 2013. We work hard to meet our community's growing demand and ensure access to rehabilitation programs for people of all ages. DeKalb Health offers rehabilitation services in Auburn and Garrett. Auburn: The 11,127-square-foot center in our hospital's North Campus was built to meet the growing demand of rehabilitation patients and to provide optimal patient care, private treatments, pediatric program growth potential and expanded orthopedic and industrial programs. Garrett: Our partnership with the Judy A. Morrill (JAM) Recreation Center in Garrett serves as an invaluable exercise, rehabilitation, and activity resource for residents of Garrett and DeKalb County. 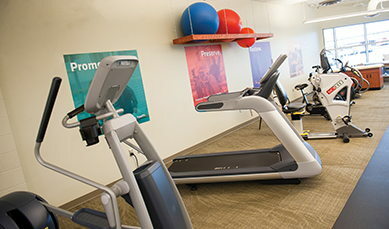 Through the partnership, DeKalb Health provides physical, occupational and aquatic therapy services on-site at the JAM Center including aquatics, exercise, and fitness. On Monday, October 1, 2018, Indiana Physical Therapy joined DeKalb Health to replace Kindred as its provider of physical and occupational services. Indiana Physical Therapy will also manage the rehabilitation services at the JAM Center and the hospital’s inpatient rehabilitation therapy. Learn more. For more information, call 260.920.2632 to schedule an appointment at either location with one of our rehabilitation specialists today.